These irons are awesome. They are just forgiving enough to score with, and just enough of a player's club, to give you feedback. Which is what you need in order to advance your game and get better. You will want to make sure you get fitted right for your swing and body size, it makes a big difference. If you get the chance to buy yourself a set, pick them up, you won't be sorry. I love my pro-c's. I also have a set of Mp-60's. I've been awsy from the game due to heslth issues but I'm ready to take my swing out on the course. Thr pro-c I'd like butter if you are a good ballstriker, which I am. My normal shot is a nice fade. I can't play with both setd. My MP-60's give me slightly more pop.anyone interested in the pro-c's, hit me up at bbro01@yahoo.com. none needed, and the gunmetal finish actually looks better with wear. Last year, I stumbled on a full set of these at the Newhall Roger Dunn in great condition. They weren't marked with a price. The guy behind the counter, obviously a dweeb, quoted me a price off the top of his head - $150! I took full advantage and asked for $100 out the door, cash. He said "no" at first, but later handed them over. I think he pocketed the money. Who cares. These ended up being the best sticks I've ever swung. They came with new oversize grips and stiff Dynamic Gold shafts. Not only are they pretty, but they are accurate and are the best of both worlds - workable with just enough forgiveness for someone like me who's a solid single digit, but doesn't play enough to be a consistently solid ball striker. So the forgiveness helps. The forging is soft so they ding easily, but God are they pretty. As nice as the Hogan Apex Plus irons I used to play, but so much easier to hit. If you can find a set, buy them! When it comes to iron play, I am without a doubt the best ball striker on this forum. It's not atypical for me to create a dime sized wear mark in the center of each iron in my set. Macgregor has come a long with these irons. First, let me digress. I would like to apologize to the reader for the poor grammar used by the previous two reviewers. Personally, I had a difficult time trying to discern exactly what they were attempting to convey about these fine sticks. Nevertheless, what I could ascertain was that they favored the irons but simply had a hard time expressing their feelings in words. Now, back to the review. I hit the pin with the 8 iron twice in the same round and I was hitting darts all day with whatever I hit. I don't think I would buy them because Macgregor doesn't have the best resell value out there. Besides, I like my Ping Eye 2s. I'm the best. So there's no need to read any other reviews. Feel and feedback are great: Oh, so sweet on center shots, pretty good on heel and toe strikes and rather harsh only on thin hits. These definitively let you know where you made contact. In that sense they are true game improvement irons. However, beeing progressive cavity backs they do not punish you distance wise on lesser strikes. 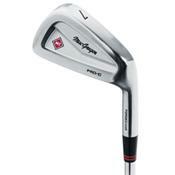 So I would encourage any avid golfer to give these a try (and to replace the 3- and 4-iron with hybrids). These are very accurate irons. To me they offer the same feel and control as Mizuno MP-60s or Titleist CBs. Only real difference is the price: I got a new set for just USD 250. I'm a 10 handicapper striving to become a 9 or better. (We all have our dreams.) These will certainly help on that way. Mine have the TT DG SL shafts installed, which are comparable to the Nippon 1150 shafts. The Nippons might be slightly livelier, the TTs might offer slighty more control. All in all I consider these the best golf club buy I have made. I only had to overcome the urge to stay with Mizuno or Titleist and to go for an now old-fashioned brand. To me that was not an easy decision. But then again you will the the only one in your foursome with these. I'm happy with these and don't look back.